Scream, Friday the 13th, Dracula, Frankenstein, and Halloween are all movies that might be featured on your television this Halloween, which we fully encourage. Everyone is entitled to a good scare on Halloween. However, one thing you might be missing are all of the tasty treats you can enjoy this time of the year. While usually, you might be a healthy eater, this time of the year allows you to let loose at least a little bit to enjoy some sugary treats. After all, if all of the ghosts, ghouls, and goblins can come out, can’t your sweet tooth? With our fresh food, though, you won’t be straying too far from your usual healthy habits. 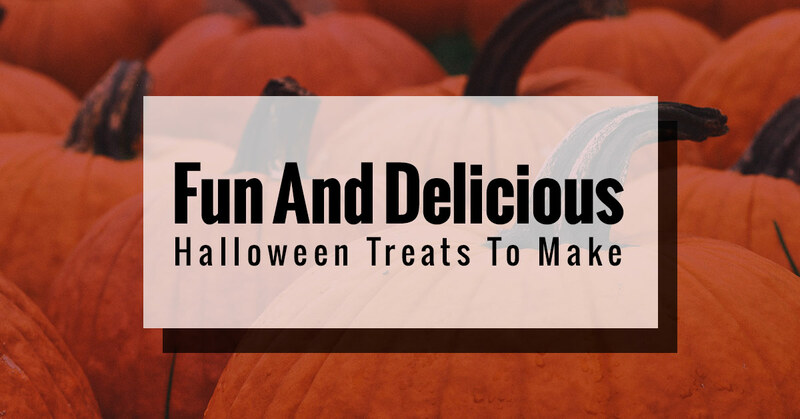 While it’s essential that you enjoy a break once in awhile from carrots and celery, we understand if you enjoy eating healthy most of the time, which is why if any of these tasty treats are filled with too much sugar or are deviating from your diet too much, then read Healthy Halloween Treats To Try. Take a break from eating healthy for a day or two and enjoy these spookily delicious treats. We gathered five of the most dreadfully good treats you can make to satisfy your sweet tooth. In addition, these horrendously tasty treats have an eldritch-type of vibe to them. From spook-tastic cupcakes to eerie party tricks, you’ll have a ball making and eating these baked goods. Make them with your children or bring them to a party, with our fresh food sweet recipes, you’ll enjoy these treats regardless of where you bring them. Acorn Candy Cookies can be made any time around this season. Made of wafers and chocolate, you can’t go wrong with these acorn shaped treats. If you want to add a little more Halloween vibe to them, then make some white chocolate and dye it red to represent blood. These cookies are made out of chocolate frosting, vanilla wafers, butterscotch chips, and candy kisses. To make these, you’ll take a wafer and then attach the Hershey’s Kiss® with chocolate frosting and butterscotch chips on the other side. If you don’t like butterscotch, then use peanut butter chips. Remember when you were little and you loved making mud pies? Well, this is pretty much the same thing, except you’re an adult and can get a little more creative and design a terrifying masterpiece. This Dirt Pudding is more like a cake and is a great way to let your creativity out. You can also make individual cups if that’s easier. The recipe calls for chocolate sandwich cookies, cream cheese, butter, confectioners sugar, milk, chocolate pudding mix, whipped cream, gummy worms, candy pumpkins, vanilla frosting, and green food coloring. You’ll want to crush up the cookies and set them to the side. Next, you’ll want to mix the cream cheese, butter, and sugar together. Whisk the milk and pudding mix together until thick, then combine the cream cheese mixture. Make a crust from the cookies and then spread half of the mixture over it followed by the candy gummy worms. Add the next layer of cookie crumbs and the pudding and then create a pumpkin patch with the candy pumpkins. Put the pumpkins in a row and leave enough room for the frosting leaves, which you’ll make out of the dyed vanilla frosting. This recipe is easy, fun, and tasty. If you want to still get fruit in your diet instead of only sugar, then the Monster Strawberry Cupcakes are perfect. These cupcakes are made of pink cake and have strawberries on top. You’ll want these little monsters to get in your belly right away. This recipe includes strawberry jam, fresh strawberries, flour, salt, baking powder, sugar, butter, egg whites, vanilla extract, pink dye, and milk. The buttercream frosting includes butter, powdered sugar, cream, green dye, and vanilla extract. For a full recipe, visit Yummy Crumble for these tantalizing little monsters. If you need to bring something that’s eerie and delicious to your Halloween party, then these Waxy Q-Tips are perfect. You can make them easily and they will be a definite hit when people get a look at these waxy treats. Furthermore, there aren’t many ingredients that you have to pick up when you come to our fresh food market. You’ll want mini marshmallows, lollipop sticks, and caramel. These Waxy Q-Tips can be an even bigger hit if you purchase the box to put them in. To make these eerie treats, melt down the caramel and place the mini marshmallows on both sides of the lollipop stick. Then you’ll want to dip each side into the caramel to make it look waxy. To cool off, place them on wax paper so they don’t stick to anything. If you love caramel corn, then this cookie recipe is the right one for you. You can make these Candy Corn White Chocolate Softbatch Cookies and have them for days — or hours depending on your sweet tooth. For this recipe, you’ll need butter, brown sugar, granulated sugar, one egg, vanilla extract, cream, flour, cornstarch, baking soda, a pinch of salt, candy corn, and white chocolate chips. For a candy-licious Halloween, you can enjoy these baked goods when you get the recipe from Averie Cooks. Joseph’s Classic Market features a variety of fresh foods that you can get for a great price. Why shop at overpriced markets for the same foods that you can get at our gourmet market? We have great specials as well, so if something is out of your price range, then just come visit us on a specific day to purchase your fresh food. From purchasing meals for your convenience to catering deals, you can’t go wrong with our fresh food market. For more information about our fresh food or to just spend less money on groceries this week, come visit us in Boca Raton or Palm Beach.